History | PEPTIDE INSTITUTE, INC.
Masahiko TSUNEMI, became the president. SAITO Research Center was established. Acquisition of license for manufacturer of drugs. All of the peptide synthesis operations were taken over by PEPTIDE INSTITUTE, INC..
PEPTIDE INSTITUTE, INC. was established. Protein Research Foundation commenced the peptide business. 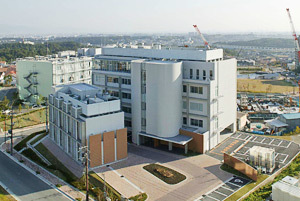 Protein Research Shore Kai (private organization) was established in Osaka University Institute for Protein Research. Osaka University Institute for Protein Research was established. 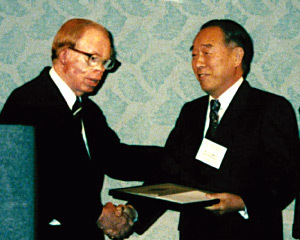 Dr. Sakakibara (right) receiving the first Merrifield Award from the Nobel Award winner Professor Merrifield (left) at the 15th American Peptide Symposium (June 18, 1997).